Sounds yummy, but really I meant peanut butter balls and sugar cookies. For my birthday this year I got a KitchenAid stand mixer (I know what a lucky girl) and I decided what better time of year than Christmas to give it a good workout. I whipped up at least 15 dozen treats, sugar cookies, peanut butter balls, and mints. 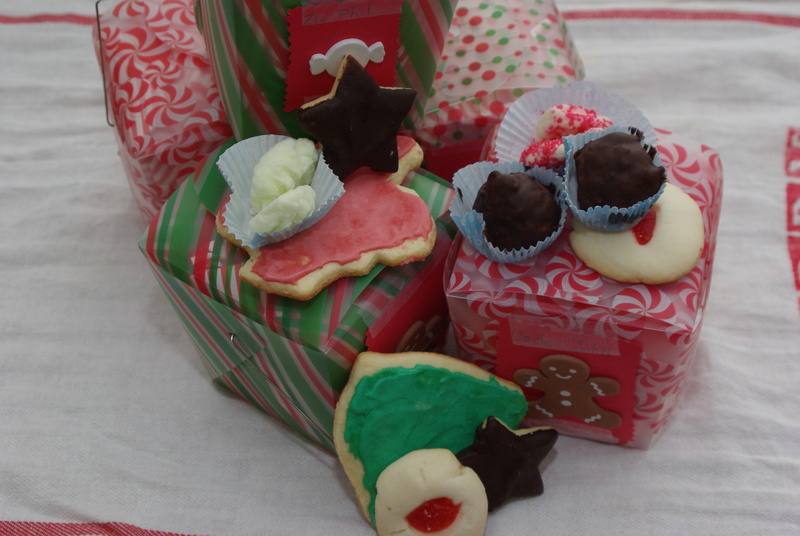 I signed up for a cookie exchange with some other moms and traded my treats with others for a little more variety, YUMMY. My go to shop for just about everything, Michael’s had these cute little boxes on sale for $1.00. With my son’s help we made little tags with card stock and Christmas stickers. As far as the recipes go, I always just google a type of treat, read the reviews and take it from there, I may or may not remember to bookmark it so it’s always a surprise. Hope you are hungry. Previous Article On the fifth day of Christmas…some lady made me Tea Towels.